John Westmark’s work has been exhibited widely and is held in collections worldwide. In 2011, he was awarded a Pollock-Krasner grant and was selected as a finalist for the Arte Laguna painting prize and exhibition, Venice, Italy. In 2012, John was awarded The Gibbes Museum of Art Factor Prize for Southern Art. (Charleston, SC) The Factor Prize acknowledges an artist whose work demonstrates the highest level of artistic achievement in any media while contributing to a new understanding of art in the South. John's work was selected to appear in Art Takes Miami (2012 edition), a limited edition publication distributed to galleries, art critics, collectors, and journalists. His work has also been featured in New American Paintings, American Art Collector, and Studio Visit Magazine. 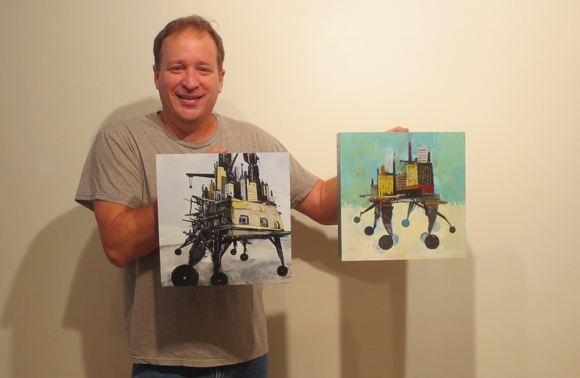 John received an MFA from the University of Florida and a BFA from the Kansas City Art Institute. He currently lives and works in Gainesville, Florida. Since the early 60’s, the idea of mobile cities – whether flying, floating, rolling, walking or otherwise – has been proposed by both architects and science fiction authors as either a solution to the challenges faced by the static city of today, or as the ultimate survival vehicle of the future. Whichever the case, this work asks you to suspend for a moment all practicality and consider a city untethered to terra firma, capable of moving on its own, dodging catastrophe or hunting new resources. Suppose for a moment that Sendai City could have rolled to higher ground before the tsunamis reached the coast. What if Staten Island could have simply gotten up and walked out of Superstorm Sandy’s path? Ultimately, after each catastrophic event, against the standard orthodoxy of rebuilding, is the fleeting revelation of an outlandish mutation.